Aside from being a blogger, I am an avid anime fan since I was a kid. My love for anime started when I was 6 years old and anime like Sailor Moon, Voltes V and Daimos are mainstream here in the Philippines. I remembered when my father buys me some Sailor Moon stuffs like lunch box, stickers, t-shirts, board game and action figures. Speaking of action figures, I started collecting last July 2015. I got a bootleg figure of Lacus Clyne from Gundam Seed because I just love the character so much and I am not able to buy those expensive ones before. 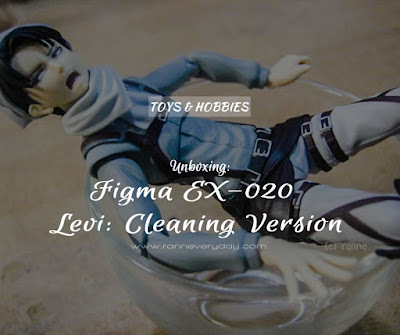 But this August 2015, I managed to buy additional four action figures and this Figma Levi: Cleaning version is my fourth one. Before I start with the unboxing, the four additional figs on my collection were all Levi Ackerman from Attack on Titan (Shingeki no Kyojin). 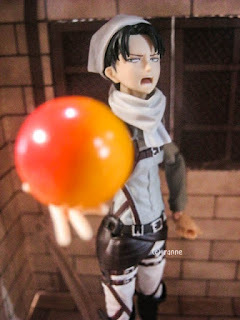 So why Levi? It’s just maybe because I am very fond with a character that is a badass and emotionless. 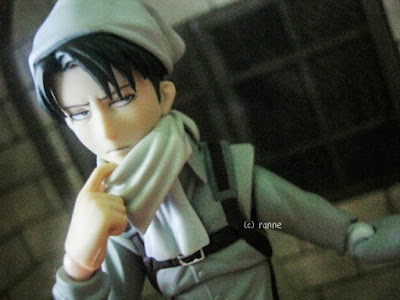 Levi is known as “Humanity’s Strongest Soldier” and for some unknown reason (which you may find it crazy); I tend to swoon over him (laughs hard). So anyway, let’s proceed with the unboxing! And by the way, this is my first time to do an unboxing with an action figure so bear with me for a while! 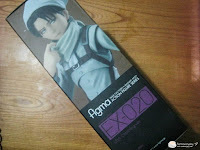 This Figma with product code EX-020 known as Levi: Cleaning version is produced by Max Factory. 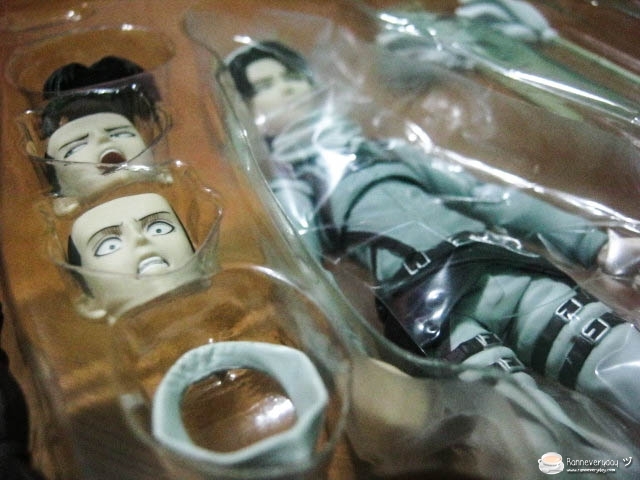 It is first shown and exclusive at Summer Wonder Festival in Japan and distributed by Good Smile Company last July 2014. 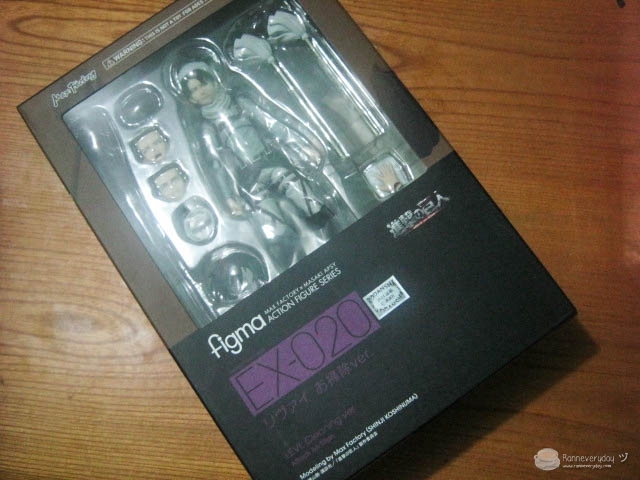 Considered as a rare figma, it was sold fast after it was released. 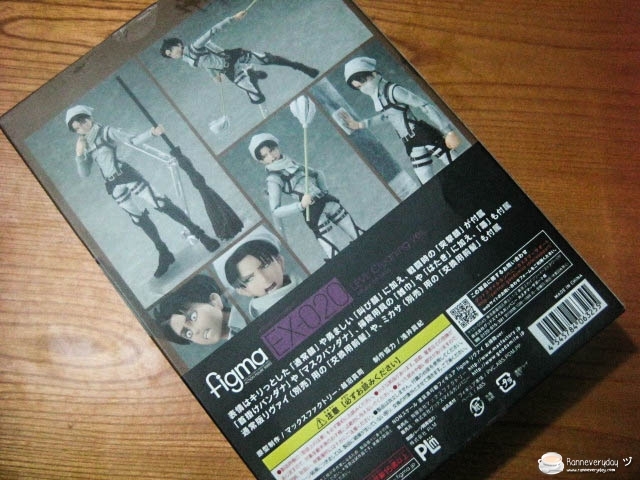 It is also the fifth Figma produced by Max Factory from anime Attack on Titan along with Figma Eren Jaeger, Mikasa Ackerman, Armin Arlert and Levi, all wearing their Survey Corps Uniform. 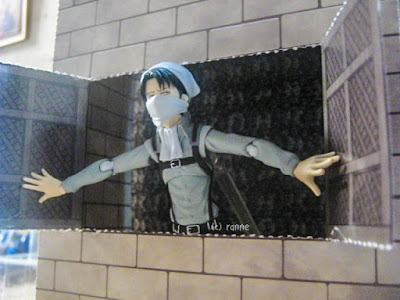 As Attack on Titan fans known, Levi Ackerman was given a joke for being a Clean Freak because of his character who disgusts anything dirty. 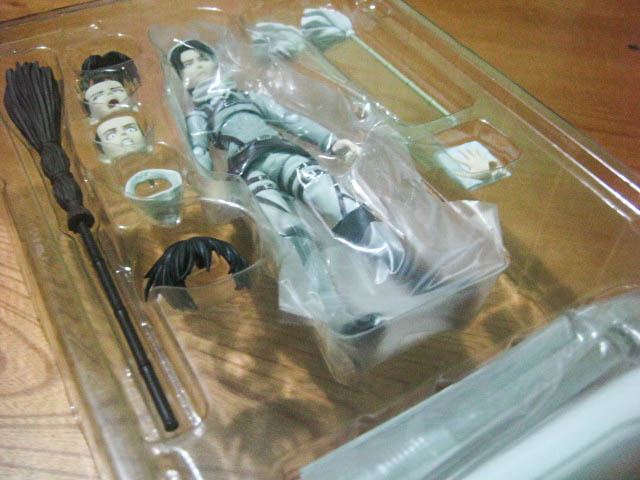 And this Figma which I’ll be going to unbox represents a perfect replica on how Levi Ackerman was shown in the anime, fighting all the dusts. 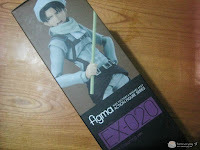 This Figma is covered in a caramel colored box with black on its lower half and white and purple text. 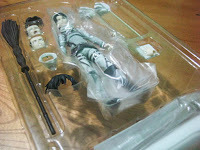 You can see Levi in different poses which you can make and imitate with this Figma on the two sides and back side of the box. Now it’s time to unbox! Here are the items which you can find inside the Figma Levi: Cleaning version box. This Figma contains this background paper, very much perfect to imitate Levi while he’s cleaning. 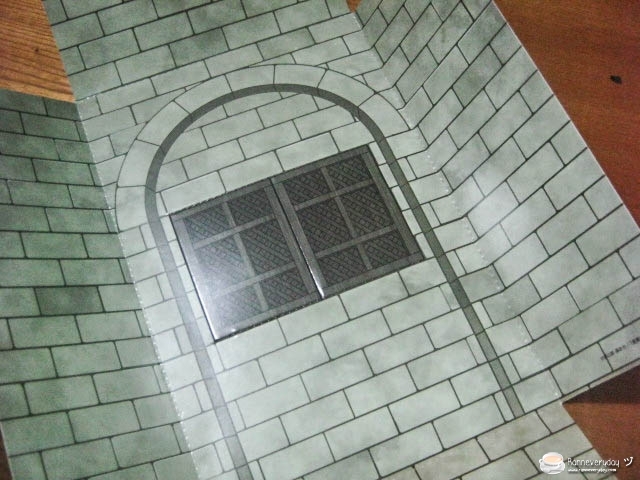 It is made of a hard, glossy paper and you can tear the two windows to make it appear like Levi is opening the windows. 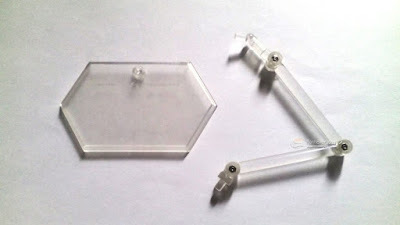 It also comes with this Figma stage (which all figmas also contains) to help re-enact different poses for your figma. 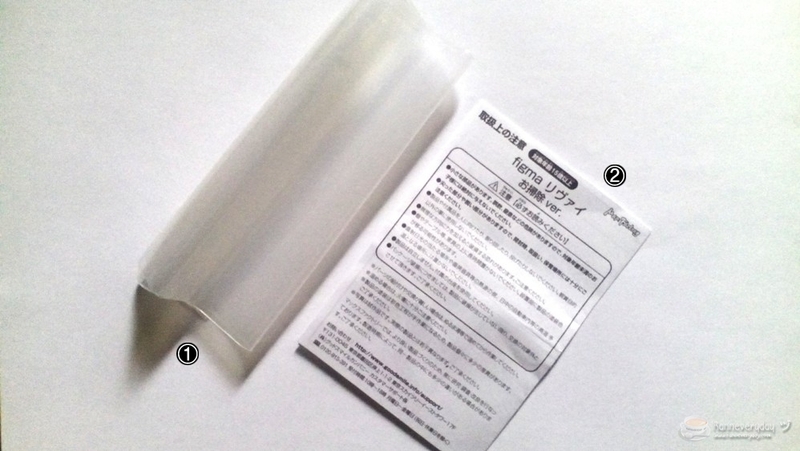 It is also comes with this Figma resealable bag on which you can use to put different accessories for your figma and this instruction manual, which is actually in Japanese language. Here are the accessories for this version of Levi: 1. Pair of dusters; 2. 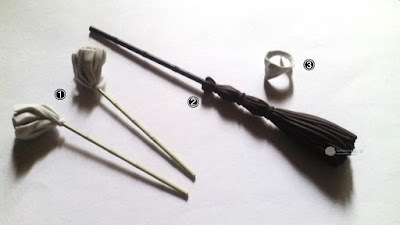 An old-school broom; 3. Cloth for covering the face. All made of plastic but also very detailed. This Figma Levi: Cleaning version contains two different hair accessories for the Figma Levi default version and for Figma Mikasa Ackerman. It is much perfect to use to portray action poses. This Figma Levi: Cleaning version comes with 4 pairs of hand and 2 other extra hands, which is perfect to use in different poses: 1. Left hand for holding the face cover; 2. Pair of hand for holding the broom; 3. Pair of hand for holding the dusters; 4. Pair of open palm hands; 5. His default hand (close hands); 6. 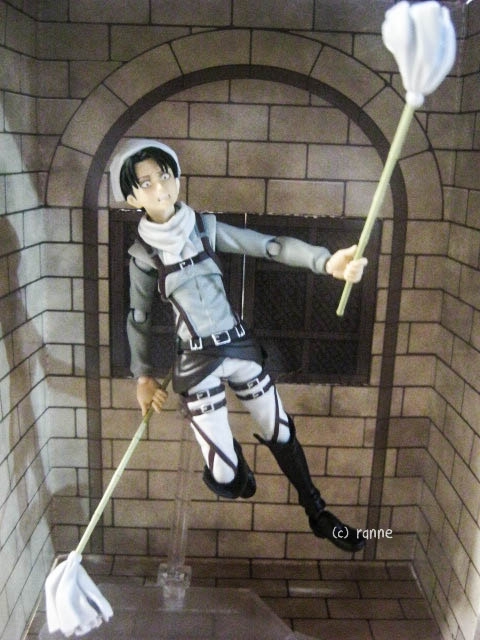 Left hand with cloth, perfect to imitate Levi while cleaning the windows or floors. If you happened to broke a wrist joint, inside the box also contains a spare of wrist joint. 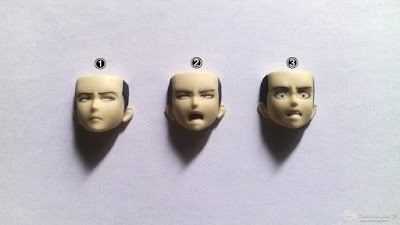 Aside from his hands, it also comes with different facial expressions: 1. Face looking sideways (default face); 2. 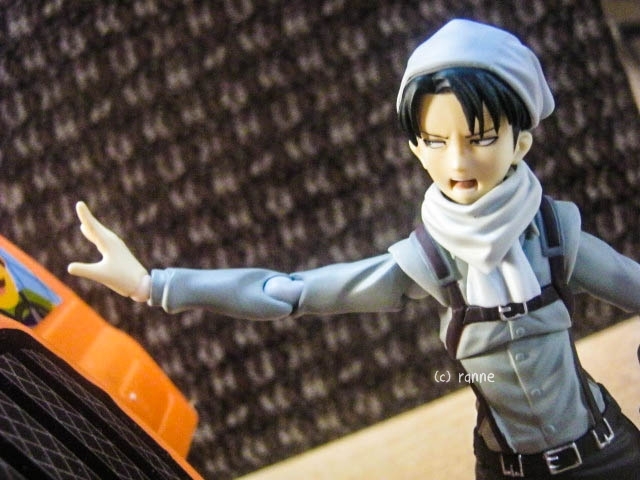 His shouting face also looking sideways; 3. 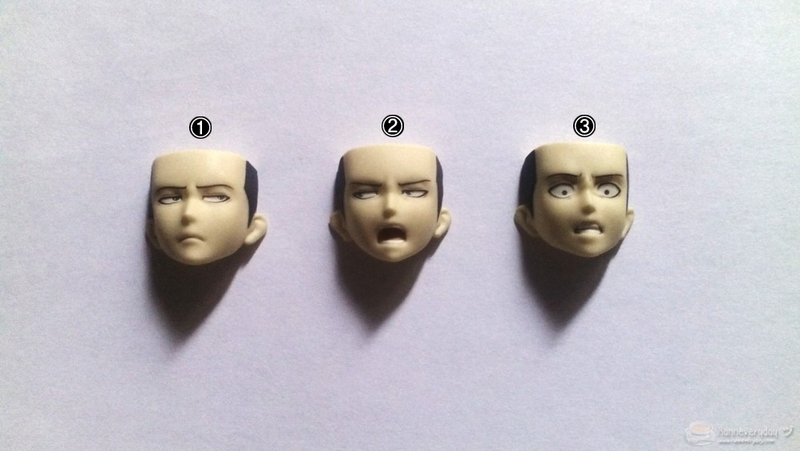 His angry face looking at the front, which is actually kind of creepy but perfect to use for action poses. Figma Levi on his cleaning attire, front and back view. 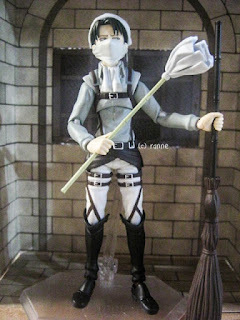 And lastly is Levi himself, on his usual cleaning attire. 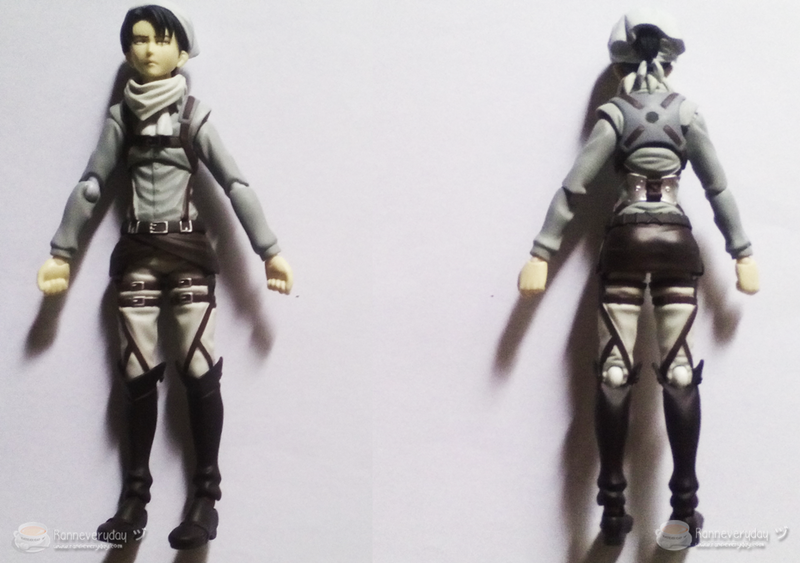 The difference between the first figma Levi—it is wearing a survey corps jacket; while this cleaning version doesn’t have it. This version has a head bandana plus an extra face cover which just hangs on his neck plus his signature neckerchief. 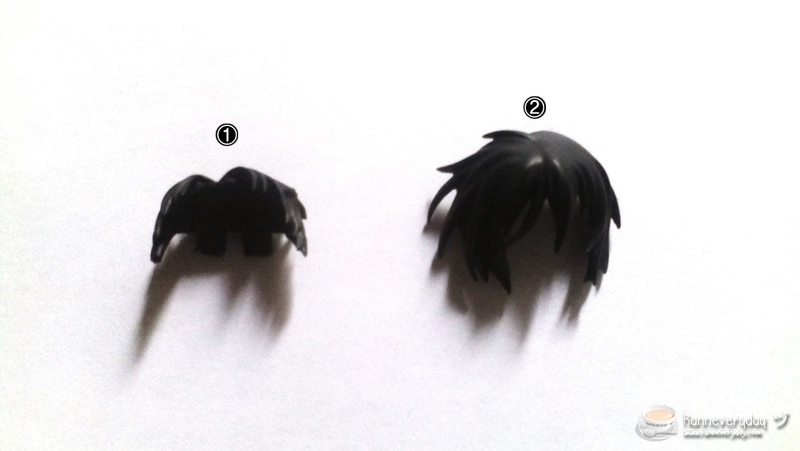 The hole at its back is where you can attach the Figma stage to help the figure to stand or do some poses. This Figma measures at approx. 5 ½ inches (14 cm). Made of a painted ABS and ATBC-PVC material, this Figma is very detailed from head-to-toe, the color is also very accurate and also its accessories. Shoulder Joint – You can rotate its arm from shoulder joint, 360 degrees. Arm Joint – You can rotate its arm from arm joint, 360 degrees. 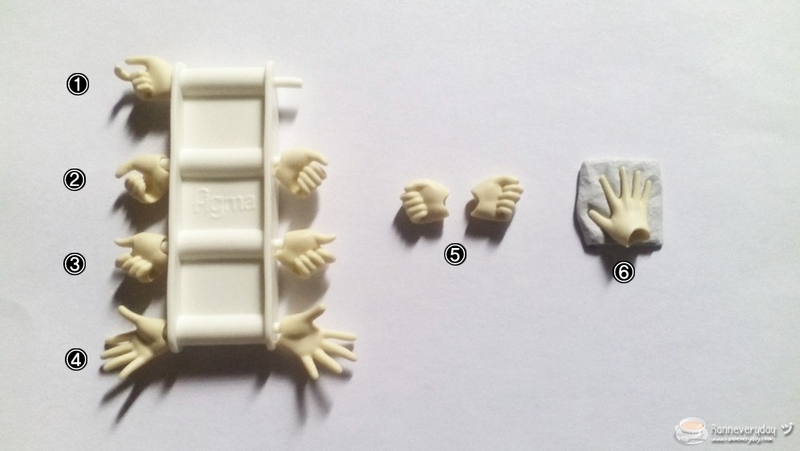 Wrist Joint – You can rotate and position its hand the way you want it to be, 360 degrees. Leg joint – You can make Levi split! You can’t rotate its leg from leg joint but you can make his legs positioned forward and backward at 45 degrees. Knee Joint – You can bend its legs for about 100 degrees from its knee joint. Ankle Joint – You can rotate its feet from ankle joint, 360 degrees. Toes joint – You can raise its toes at 45 degrees. 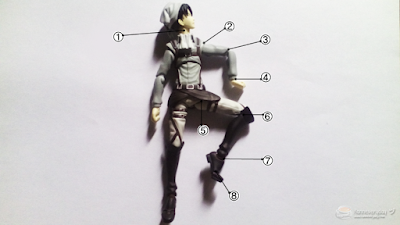 There is also a joint located between his chest and tummy, in which can help you make some poses like leaning forward, backward and sideways. If you want to see more photos and also my other collections, please feel free to visit me on DeviantArt. You can also follow me and I’ll surely follow back! 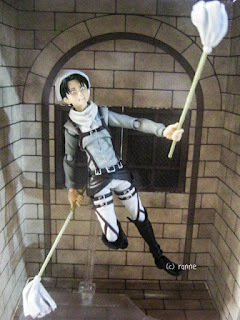 For something as small as this, getting a figure as accurate like this Figma Levi: Cleaning version is worth every cent you spent. The colors and the details are accurate plus having joints can make you play with it in different poses. It is also a perfect action figure if you are fond of Toy Photography. I would highly recommend of buying action figures like Figma but be sure to buy the authentic ones so you can really enjoy every detail and accessories. For my overall rating, it will be 9.5 out of 10. (10 is the highest). If you are wondering on where I bought this Figma, I bought it on Collecticon last September 25, 2015. 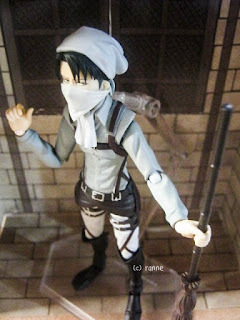 Hubbyte Toy Store was one of the stores which happened to have a booth that time and bought this Figma Levi: Cleaning Version on a discounted price (thank you very much guys!). They are also the first to be an official distributor of Good Smile Company in Japan here in the Philippines so be sure to drop by and visit Hubbyte Toy Store! I’ll be featuring them on a separate blog post soon so be sure to check it out! Since it’s my first time to do an unboxing of an action figure, I wanna hear your thoughts! Feel free to comment down some suggestions to help me improve. I will be sharing more of my toy collections if I happened to buy new ones soon. And also, thank you very much for reading!